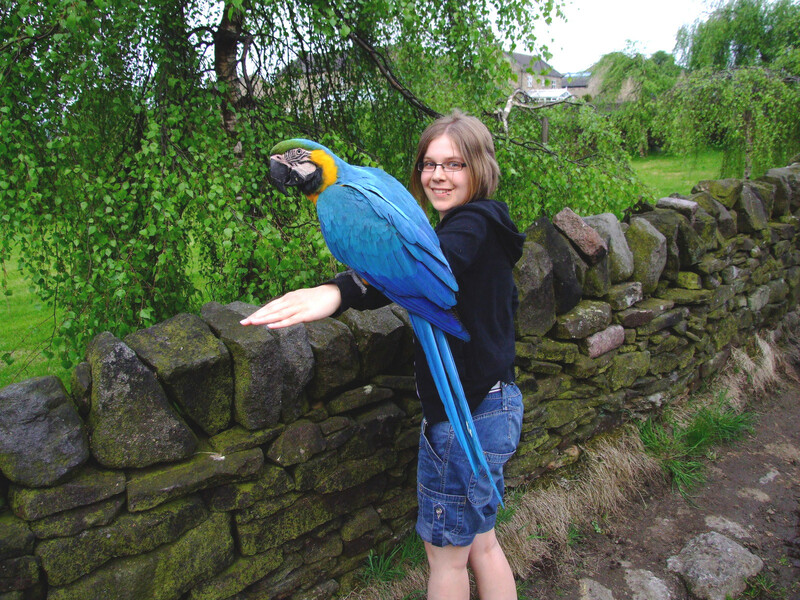 Somebody asked on the forum recently if there was any news about Elvis, the beautiful parrot who previously was allowed to fly free around our village of Wilsden. Whilst the vast majority loved this colourful addition to the village, some (rather mean-spirited) people accused him of damaging their property (although Elvis' owners did say they would pay for any damage he caused). The final straw came when a local resident (who also happened to work in the council) officially complained about him and he was given an 'asbo' - meaning he would have to be kept locked up. Whilst Elvis had a very large outdoor cage in his owner's back garden, it would have been upsetting to keep Elvis locked up, and his owner took the difficult decision to offer him to a bird sanctuary rather than keep him caged and unhappy. We thought that was the end of the story, but recently we heard that Elvis was back in the area but now living in a local Garden Centre. We visited the Garden Centre this weekend and it was quite upsetting as Elvis was clearly bored and fed up of been stuck in a tiny cage with little to do, few toys and only dirty bare cardboard on the floor. What's worse there was a sign that said "I like to fly which is why I have a large cage" - it's too small for a bird his size, and he can't even fly in it!! I'm hoping that he spends time away from the garden centre in a larger enclosure, but I'm guessing he spends all his time in the cage above. A very sad end to what was a lovely and quirky story. OK here comes the RANT. What idiot decided to keep this beautiful bird closed up in a cage when he has been used to flying free. What crime did he commit to deserve such treatment, he is not a thief or a murderer. He has tasted freedom so no wonder he is sad, so would I be! I think the person who put him in the cage should spend some time in there too and feel what it is like. I am puzzled as to why he was moved from a sanctuary (which seems like a good idea) to a garden centre. His original owners may as well have kept him if he has to be locked up like that. GGRRR I hope you can get the local paper interested to follow this story. Hooomins sometimes we is so stoopid!!!!! It is horrible isn't it? Get the Argus telegraph bradford thingy onto it. tell them there are people all over the country - the world - outraged at the treatment of this beautiful bird. Yes, I am Outraged of Birmingham. I see they've even padlocked him in so you can't birdnap him. Such a shame. Neil, is it worth getting on to National TV. Does not hurt to ask? I wonder if they could legally even give him an ASBO? Surely if he was safe and happy flying wild, then that's ok? I know I go on about cats (lol) but they are ok let out and they get up to all sorts of mischief (crapping on neighbour's lawns, killing wildlife, getting run over etc etc) - what's the difference? The council worker who was moaning last time even moved out of the village I think so what has it got to do with her?! I was thinking about that story you posted (Neil) about the snake that ate the cat and the outcry there was because it was the neighbour's pet cat. Do you think there'd have been the same calls for restrictions on it if it'd eaten my pet rat? No, I don't think so either. No, it's all based on people's reactions to the animals in question, isn't it? Exactly, like so many other things. Humans are strange creatures. Neil, I still wonder if the big TV/media people would be interested. Why not start a support group on FB. not sure but it might help. Any more news on how things are for Elvis? Still the same. The zoo where i did a day's zookeeping take on unwanted pets, there are rescue tortoises, ex-battery hens and macaws. A lot of the macaws were poorly feathered from feather plucking through boredom, and now they were in this lovely enclosure flying around and nattering to each other. It was v.cute! Not sure if my dad has any photos of it actually...dad?? It was amazing because there was a sudden rain shower, and rather than hide (which I thought they would do), the parrots all flew onto the top of nearby bushes, spread their wings, and started showering and preening themselves - it was fantastic! Really felt like they were genuinely happy and showing their 'natural' behaviour. I too think Elvis would have a far, far better quality of life if he were to be rescued by the South Lakes Wildlife Park - and it would be a very nice ending to the whole saga. Chase 'em up and make that very suggestion! And write to the wildlife dept at the BBC. And copy that to Sky Discovery channels. And cc the letters to the wildlife park and the garden centre/pet shop place. We went to Twycross Zoo today. They had a new walk-through aviary, but it was all small birds. (I'd love to see one for big birds!) They weren't a bit bothered by people being in there. It was lovely because the zoo was quiet so it was just me and hubby. When we were leaving the aviary there was a little bird (about the size of a zebra finch but the brightest colours you could imagine!) that had got through the heavy plastic curtain things and didn't know how to get back. Hubby said to leave it, it'd be OK but I couldn't. So I held the curtains open and it flew straight back through to the enclosure! I felt so proud of myself for helping it. Posted By: Kateb So I held the curtains open and it flew straight back through to the enclosure! I felt so proud of myself for helping it. Well done! :D Are you feeling better now, Kate? Thanks Lynn! If I can get the photos from my phone to the pooter I'll post a picture. I haven't felt too bad this week, just bouts of tiredness which the doc said was to be expected. However, I originally thought all this was hormonal, as certain weeks were better than others, and this would've been a good week anyway. I hope by the time next week comes the iron tablets will have started to boost my blood. You'll have to go on the swings and lick your fingers...that's how I remember tasting iron! My ma used to dose us with Minadex - is that still around? Bleugh!!!! I remember that taste well - we used to spend a lot of time in the park on the way home from school. The witches hat was my favourite! Haven't heard of minadex, but that doesn't mean its not around any more! Hi I am new to this forum, I found it by googling Elvis the Parrot. I wrote to the Keighley News and told them of my disgust at his treatment,way back when the news of Elvis's exile was announced, I had my letter published (see attached). I too have been upset by the sight of poor Elvis in his cage at the garden centre, he is indeed pulling feathers out in boardom and there is no way he would be able to fly. How sad that a lovely clever creature like that is reduced to a side show! I dont know how he ended up there, what happened to the sanctury in Shropshire? Is there not Parrot Rescue organisation? Posted By: chief chicken Is there not Parrot Rescue organisation? Probably the only way is to highlight the fact he's not happy and that there are better options, but quite honestly, when I sent details nobody (media, papers or whatever) was in the slightest interested in covering it... So well done Liz for getting more coverage than I was able to. I work at Woodbank garden centre, and as one of the comments above here says, there is no way the boss would allow for Elvis to be taken, we are all attached to Elvis at the garden centre, and yes, he is happy, we take him out regularly to fly around the owners garden. Now as for the harsh comment "but really how would garden centre staff know he was happy" which I found, frankly, offensive, how would you know if Elvis is happy? The only person who would know that is the person who spends the most amount of time with him, which is Stephan, he looks after him and we make sure he is cleaned out and fed daily, they seem the understand each other well and he knows how Elvis is feeling. Elvis does also bring in a few customers at the nursery, which obviously brings in small profits, I know that sounds awful but I was searching for him on Google and found this forums, to be honest, slanting where I work and giving negative comments, while actually I really enjoy working there and all the staff are friendly. As I've said, we are all good to him, and he's good back to us. I hope that has settled some of your concerns for this case. No, this hasn't settled my concerns at all. And now I'm sorry if I sound harsh, but how can you possibly say Elvis is happier spending the majority of his time in a tiny cage (and yes, it is a small cage, and yes it is the majority of his time!) when he was used to flying around the whole of Wilsden, Harden and even Cullingworth?! Also, there is no way you can say he is happy there. He isn't. I visit often, and that parrot is showing signs of depression, loneliness and frustration. The cage he is in is too small for him to fly and there is nothing for him to do in there. What happened to him going to live happily at the sanctuary?! I think it's so sad that you keep that poor parrot, who is used to living a life of freedom, caged most of the time simply to bring in more customers. I am very close to people who work at Woodbank too, I spend a lot of time there, and I know for a fact Elvis is not a happy parrot. He should be at a sanctuary where he can fly, we know of a brilliant place that will have him but no, lets keep him caged so he can bring in the customers. That doesn't seem fair to me. First hi Lizzy to hencam and well done for suceeding in having your letter published. Elvis Parrot I agree 100% with Red and no our 'concerns are not settled'. Who is this person who calls themself 'Elvis Parrot'? I wondered. I thought for one moment Elvis himself had decided to hop on here and have his say. Just because those at Woodbank are all attached to Elvis does not make it right that you should keep him locked up in a cage for customers to gawk at. A clean cage and fresh food are not the only requirements for a happy healthy bird. Surely there are other more friendly ways to make money. How could you possibly think he is happy? He is a big bird, meant to fly free as he once did over Wilsden coming back home for food and attention or be placed with a Sanctuary which would be an ideal life. If you consider we are slanting your work place and being negative then so be it. We on this forum actually care about animals and do not keep them captive just to suit our own selfish needs but believe in giving animals a life as close to that which nature intended. Being cooped up in a cage most of the time is not what nature intended. He needs to experience at least some freedom and I do believe his needs are NOT being met. How can they be when you all have to attend to the running of a business. Our local vet who is also a dear friend and considered the top bird vet in the region agrees with myself and Red's concerns. We can only hope that one day Elvis makes a break for freedom and finds a loving home once more. I work at Woodbank garden centre, and as one of the comments above here says, there is no way the boss would allow for Elvis to be taken, we are all attached to Elvis at the garden centre, and yes, he is happy, we take him out regularly to fly around the owners garden. First of all, thanks for signing up and sharing your views, although we might not agree it's good to get another side of the story. Now as for the harsh comment "but really how would garden centre staff know he was happy" which I found, frankly, offensive, how would you know if Elvis is happy? The only person who would know that is the person who spends the most amount of time with him, which is Stephan, he looks after him and we make sure he is cleaned out and fed daily, they seem the understand each other well and he knows how Elvis is feeling. How is that harsh in any way? Does anyone there have any experience at all with exotic birds or parrots?! It's a garden center not a zoo! Has a trained and experienced exotic animal vet seen the conditions and given the thumbs up, especially considering Elvis' previous freedom of Wilsden? I would suggest to you that seeing an essentially wild exotic animal displaying as natural behaviour as possible, ie: flying around a huge open expanse, with no constraints, and returning to his home when he feels like it for food and protection, would result in a happier life than being imprisoned in what can only be described as a small prison cell in comparison - which do you think is best for any animal's welfare or mental state? There is a *lot* more to knowing an animal than simply feeding it and cleaning up it's crap. Whilst Stephan may have Elvis' best interests to heart, it still can't compare in any way to what a wildlife sanctuary could offer. Not awful really, these are hard times. But I can genuinely and honestly say that I suspect Elvis' plight (and his current treatment and living conditions) have done more to harm Woodbank Nursery's reputation than it has brought in 'new' customers. There will be some that will ooh and aah over the 'pretty bird' but I suspect most clued up people will be pretty disgusted at how he's kept, and he is showing signs of frustration and aggression, similar to that seen in animals kept caged. but I was searching for him on Google and found this forums, to be honest, slanting where I work and giving negative comments, while actually I really enjoy working there and all the staff are friendly. As I've said, we are all good to him, and he's good back to us. I hope I've pointed out that you didn't really settle anything. Woodbank Nursery in Harden may become known more for it's cruelty to Parrots than it's Christmas display, which would be a shame for all concerned. Do you really think a bird like this should be kept in such a small cage? (and yes, this is a picture from when we went on a walk in Wilsden, and Elvis followed us, eventually climbing down from a tree onto Scarlet's arm. Hardly the 'terror of Wilsden' the papers made him out to be, and shows how he enjoyed his freedom so much which is denied to him now. I think they mean 'slating' (as in rubbishing) not slanting. I often wonder if the person(s) that had him confined to captivity ever have a pang of guilt, especially when his only crime was being a bird and doing what birds do. Your replies are all excellent and I don't think I can add anything, except that I am sure Stephan is trying to do his best, but as is so often seen, he really doesn't know what is 'best' or he'd be trying to get the owner to move Elvis to a sanctuary. Birds are given wings to fly, not to sit in a cage. 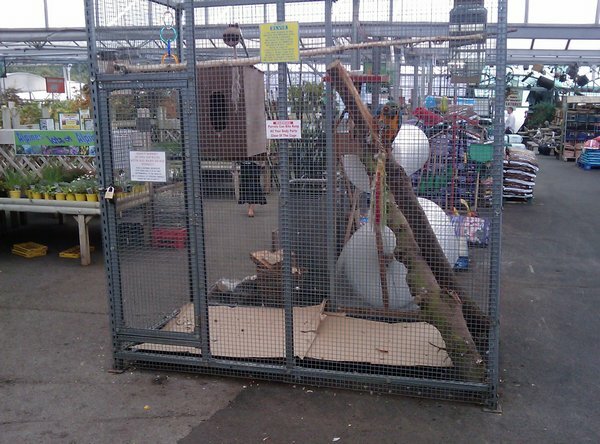 At least with a small bird a large aviary can be built so that they can fly around as close to nature as possible, but for a bird like Elvis that isn't possible in a garden centre. I would also like to know just how much free flight Elvis gets. Well said Neil. That is a really beautiful photo of Elvis and Red. You have 'captured' them both beautifully. Do you mind if I use it as my desk top background pic? I'm asking as I'm very aware of copyright. Even our budgie is let out of her cage to fly around the house regularly. She swoops and dives and loves playing with us and her toys. Our vet said all birds need to be able to fly properly and need regular exercise just like us. I am so impressed with the way Scarlet (and Lyle)take all of the pets out of their homes and they get to walk, run, crawl and explore, they dont just sit there cooped up all th time. I think it is obvious Stephan does care about Elvis (I wasn't implying he didn't), but imagine how Elvis would be if he were kept in a sanctuary with other parrots the same as him, able to fly freely around a huge enclosure. The last time we were at the sanctuary, it suddenly started raining, and all the parrots flew out and landed on the trees and started waving their wings - we didn't know what was going on until we realised, they were having a shower! it was amazing watching the natural behaviour, and something he definitely can't do in Woodbank Nurseries. I called in to the garden centre near work on the way home for some rat supplies. As usual, I went to have a look at the animals because I like to check they have food, water and clean bedding - so far I've found them without water once and out of date food on the shelves twice. I wouldn't buy from there but my usual shop has run out of rat litter. Anyway, as I walked past a white bird (Cockatiel maybe?) it squawked at me so I stopped. I spoke to it for a while, and it bobbed and chatted back. Then it tried desperately to open the lock on first one side of the door and then the other. I noticed it had no toys at all, and I guessed that if it stretches its wings they are probably about an inch from touching the cage sides. What a terrible, sad existence for a beautiful and obviously very intelligent bird. Even the lizards had interesting environments (not that they deserve less). There were no staff around to complain to and I felt very sad walking away. Oh Kate doesnt your heart just go out to them when you see a lovely birdie like that in such a small cage. They are intelligent aren't they and love to interact with humans. Well parrots have the comparable intelligence to a 3 - 4 year old child...imagine a child that young being locked in a cage with nothing to do! TM, thanks for the lovely comment about how we look after our animals And feel free to use the pic, Elvis is a stunner isn't he! It would be like putting Caitlyn in a cage - she's almost 3. I don't think there's a cage strong enough to hold her! TM is right - I had exactly the same thought. There is so much cruelty against animals it is heartwarming to see that you not only care for them but put a lot of effort into finding out as much as possible about them. Why do us humans think that animals are dumb and we are more intelligent? I'm afraid I often find out that the opposite is true. Wow I now have that stunning pic on my desk top Red and Neil, Elvis looks even better up close, he is a beautiful bird and it's a lovely pic of Red too with that dry stone wall in the background. We have lots of them around here built by farmers many years ago and most are still standing. My feelings are that Elvis should not be kept caged up. The only way to find out how that feels is for a person to have their freedom curtailed and then to see how it feels. It hurts my heart every time I see caged birds and a bird the size of Elvis needs the freedom to stretch his wings. I cannot see how he can be accused of terrorizing anyone.